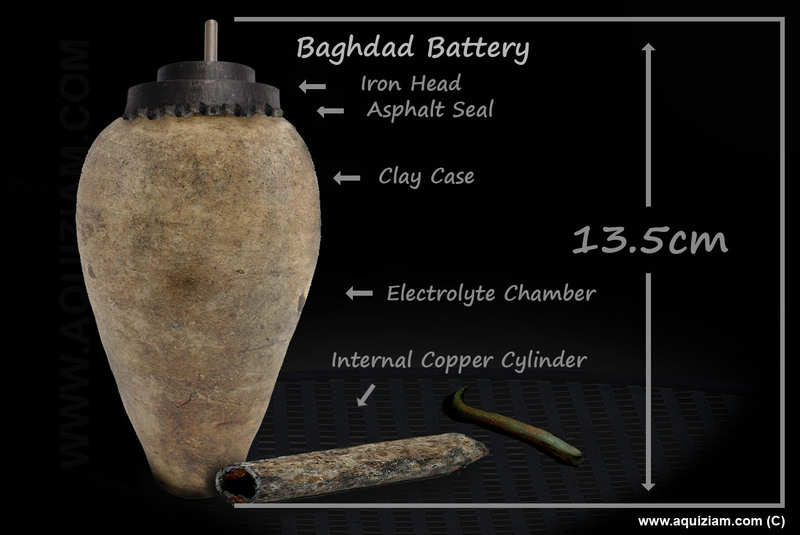 The Baghdad Battery is one of those rare archaeological discoveries that has the potential to make us doubt everything we assume we know about ancient civilizations and, as such, it really annoys many archaeologists and compulsive debunkers. During 1936 the archaeological excavations of a necropolis south of Baghdad known as Khujut Rabu revealed a very curious item of pottery that stood out from the usual finds of glassware, figurines, engraved tablets, and storage jars common to the region. It was a small clay jar around 15cm in height and sealed by a bitumen stopper. The jar contained a copper cylinder which itself contained an iron rod. Both items showed signs of significant corrosion as if the metals had been exposed to acids. The age of the artefact and the site of the dig was dated to the Parthian period which occurred from the first century BC to around 190 AD. The jar was sent to the Baghdad Museum for safekeeping until it could be properly examined. Two years later in 1938 when the Item was officially examined by Wilhelm König (Koenig), the Director / leader of the Baghdad Antiquity Administration as head of the laboratory at the Baghdad Museum, he suggested that the artefact was very similar to an acid-based battery of the kind invented by Alessandro Volta in 1800. The Austrian / German archaeologist and painter stated that if the jar was filled with a weak acid then the chemical reaction between the copper and the iron would produce a small electric current and referred to it as the Parthian Battery. A scan of the book written by Wilhelm Konig and published in 1940. Koenig supported his hypothesis of a battery by his observation of a similar but modern device used by the goldsmiths of Baghdad to carry out simple electroplating techniques. During this reaction metallic gold from a solution of gold salts is deposited on the object being plated. Koenig suggested that electroplating may have had a far more ancient origin than scholars had imagined. Simple tests and calculations showed that although the ‘Baghdad Battery could generate an electrical current this was very small. However, König proposed that many of these devices could have been connected in series to create a current of sufficient power. To support this theory he identified a number of jewellery items from the period that were remarkably fine and could have been the product of this technique. In 1939 the German engineer and science enthusiast, Willy Ley further promoted König’s (Koenig’s) ideas and for the first time brought them to the attention of the general public. 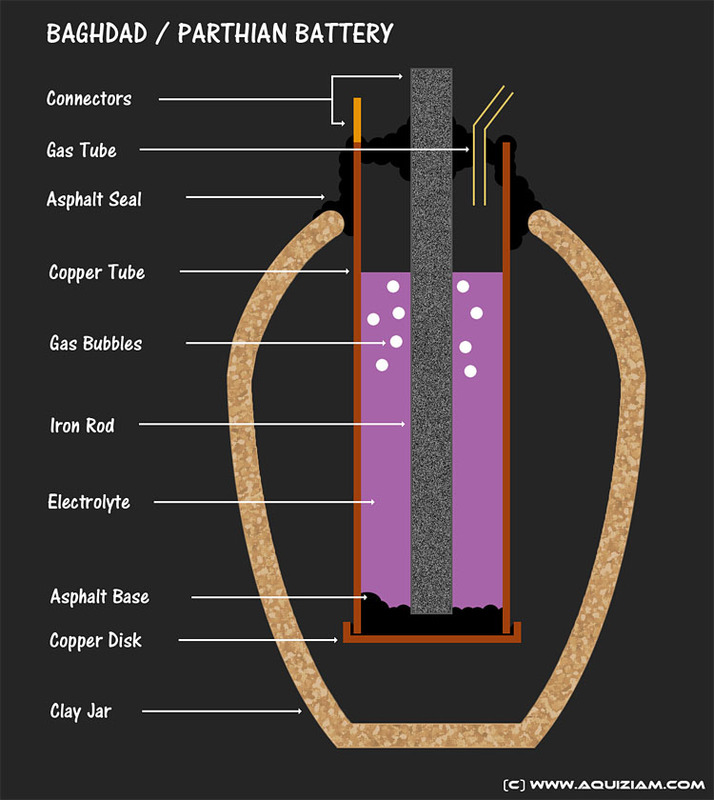 The outbreak of WWII overshadowed the story of the Baghdad Battery and it wasn’t until the war had ended that Willard Gray, an American researcher working for General Electric recreated the Baghdad Battery and conclusively proved that a current could be generated by using grape juice as the electrolyte solution. Since then his test has been repeated many times including tests using a solution of lemon juice. During 1978 Baghdad Battery was displayed at an exhibition in the Iraq Roemer and Pelizaeus Museum in Hildesheim, Germany. The Display and catalogue clearly stated that the object was used for generating electricity long before the invention of the Voltaic pile. Arne Eggebrecht, the Museum Director then succeeded in assembling a collective battery of these “batteries” and used the current generated to coat a metal object in an extremely thin layer of gold. In 2005 the Discovery Channel TV programme Myth Busters examined the science behind the Baghdad Battery and reproduced the earlier experiments. They then demonstrated that these devices could have been used for electroplating. In a rare case of ‘not busting a myth’ the team, led by Jamie Hyneman and Adam Savage, concluded that the Baghdad Battery concept was plausible. NO SALTS, NO ELECTRODES AND A BUILD UP OF GAS? The original idea that the Baghdad Battery was used for electroplating quickly ran into a few problems which have often been cited by historians and mainstream scientists seeking to debunk the idea of early electricity. Firstly, the ability to make gold salts for electroplating wasn’t officially invented until the age of alchemy during the late Middle Ages and Renaissance period. Without this solution the gold plating process simple could not take place. Secondly, the cap of the original battery did not appear to have the necessary electrical connection points. Thirdly, the seal of the bitumen cap would cause a build-up of gasses reducing the effectiveness of the battery. All these points are rather weak and depend on the principle that if historians have not discovered it then it – whatever it is – simply did not exist. Also, motivations change across historical time and to judge the actions of the ancients by our own standards is a terrible mistake. 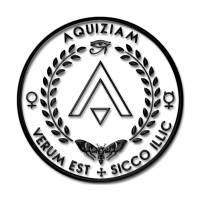 As modern research rethinks its position on the abilities of the ancients it is becoming ever clearer that they knew much more than the early Victorian scholars gave them credit for. The historical record is littered with examples of ancient technology that was ‘too early’ for its time. Some notable and unchallenged examples include the Antikythera Mechanism, Drill Sockets of the Pharos, the Phaistos disc and even the language known as the Indus Script. The truth is that it is possible that early Parthian scholars had developed a form of gold salts. The lack of record is also easily explained as the electroplating process would have been considered magical it is not surprising that it would have been kept a closely guarded secret. With regard to the lack of electrodes that too is easily explained. At the time of the Baghdad Battery both iron and copper were relatively difficult to come by. To waste this material on large electrodes that protruded through the cap (as we do today) would have been considered ridiculous at the time. It would have been far easier to simply run a wire from the internal elements and out through the edge of the bitumen. These thin copper wires could have easily been isolated from each other by first dipping the wire in bitumen to create a coating. An interesting point is that the jars have been identified to have bitumen residue inside the container. Finally, although it would have been inconvenient to open and reseal the battery there is no evidence that this did not take place. The answer as to why the ancients would have sealed the battery is simple – as with tombs, letters, and storage boxes they were sealed to prevent other people seeing the secret mechanism inside the jar. The inconvenience of opening and resealing the jars would have been irrelevant compared to the importance of keeping the technology secret from the uninitiated. Another challenge often raised is this: If they weren’t used for electroplating then what could they have been used for? 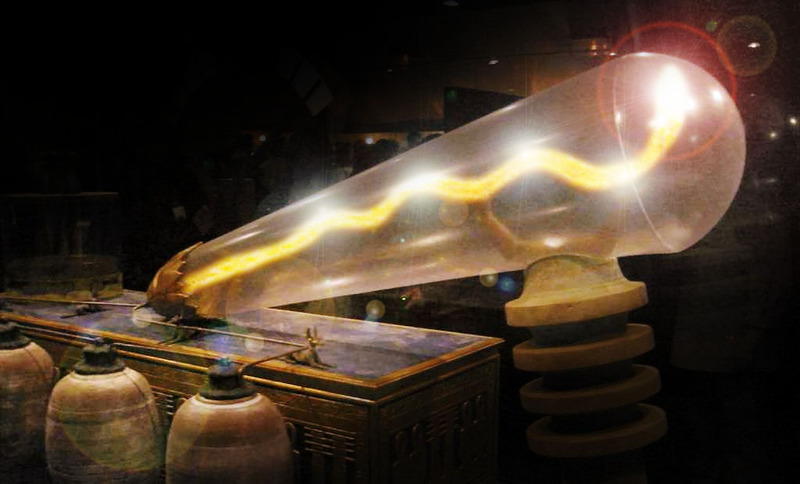 One researcher, Paul T. Keyser, proposed other electrical applications for the Baghdad Battery included a form of electrotherapy or electrostimulation, which could be performed within a religious framework. If several batteries were connect in series then enough charge could be stored to provide a meaningful shock if a person touched a religious artefact. To early people this would have indeed seemed to be the power of God. A further idea put forward by researchers is that the batteries were used to power a simple form of electric light and have supported this argument by pointing out that the carvings at the Temple complex of Dendera in Egypt do appear to show this process taking place. However, it is also worth mentioning that mainstream Egyptologists strongly refute this claim. OK – IF NOT A BATTERY THEN WHAT WAS IT? So far the best the archaeologists and historians have been able to suggest is that these jars were used to store hermetically sealed documents. Some debunkers have suggested that the jar was actually made by König (Koenig) who combined a scroll preservation jar with simple metalwork tools. There is absolutely no evidence to support this claim. Another theory suggests they might have been used to repair wineskins. It’s amusing that debunkers are often forced to admit that there are actually more problems with these alternative proposals than with Koenig’s original idea of an ancient battery. Perhaps the real issue is that many people simply can’t change their preconceptions because to accept such a thing is to also open the door to many other challenges that could very well alter mankind’s understand of our history, origins and beliefs.